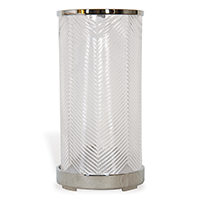 The Port 68 Westwood English Polished Nickle Hurricane features a classic chevron pattern accented on our glass hurricane. Dramatic when shown in pairs on the mantle or in sets of fours on a cocktail table. Size: 15" H x 7.5" Diam. Finish: Base and Top Crown Finished in Polished Nickle.